Winning Marriage Proposals That Made Us Go Weak In The Knees At Rio Olympics 2016! Rio Olympics 2016 has been a wind of emotions for us Indians as we proudly watched girl power take over and preserve the pride of our nation. While on one side, the entire nation came together to watch not cricket, but P.V. Sindhu battle for a gold medal in Badminton, on the other side, love managed to squeeze its way amidst all the competitive spirit. We’re talking about the heart-warming marriage proposals that triumphed over the raw emotions of winning medals. These couples took advantage of the perfect stage that gave worldwide coverage to their winning marriage proposals at Rio Olympics 2016. Take a look! Britain's Charlotte Dujardin, first yelled “Yes” with joy on winning her third gold medal for the individual dressage. She then went on to say “Yes” to her long-time boyfriend Dean Goulding’s marriage proposal. He gave her a sweet surprise wearing a #1 foam finger (indicating that she is indeed his #1) and a t-shirt with a message: Can we get married now? Looks like he has waited too long for this one and finally, this cute couple is happily engaged, ready to tie the knot next year. After winning her silver medal in 3m springboard, China’s He Zi was made to dive straight into an everlasting bond of love by her boyfriend Qin Kai. 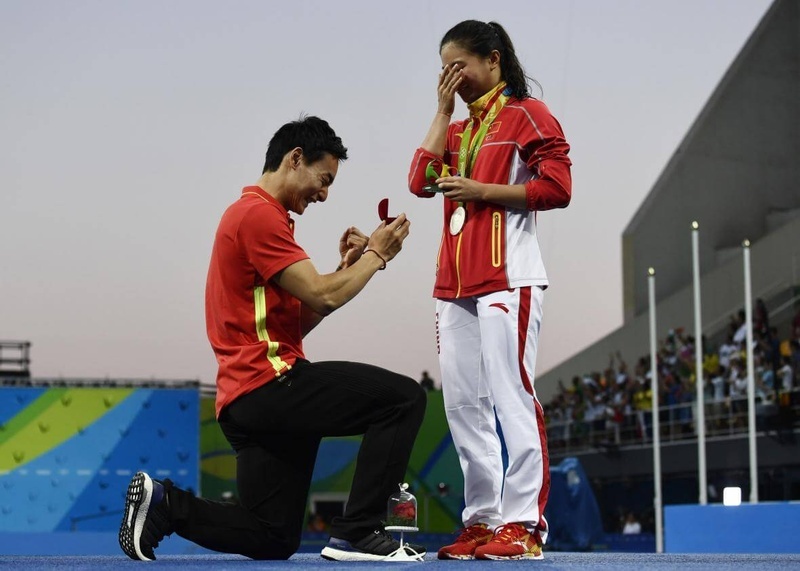 Soon after being presented with the silver medal, Qin walked to the podium and traditionally went down on one knee popping the big question on the biggest stage he could ever get! Caught by surprise, He Zi was filled with emotions. Covering her tears, she simply nodded as her sign of acceptance. They then sealed the deal by lovingly embracing each other! Aww, such cuties! While the girls rocked it out, the boys weren’t way far behind. Britain’s race walker Tom Bosworth had a rather simple and traditional approach to his marriage proposal. While strolling at Copacabana beach, he went down on one knee and proposed to his boyfriend Harry Dineley. The sheer delight on Harry’s face says it all! > 12 Unique Marriage Proposal Ideas to Make Her Say "YES"! > Chocolate Marriage Proposal Ideas to Make her Swoon!